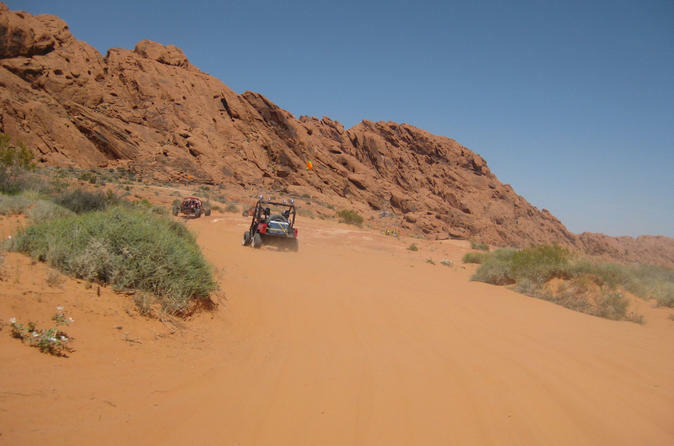 Steer a buggy through the unusual red rock formations of the Valley of Fire during this full-day tour from Las Vegas. Following a local adventure guide, take an easy and smooth ride for 3.5 hours through the stunning desert landscape in a safe buggy that seats 2 people. Round-trip transportation, safety equipment and lunch are included. Nach der Abholung in Ihrem Hotel in Las Vegas reisen Sie in einem komfortablen Fahrzeug in das Valley of Fire. Diese Fahrt dauert etwa eine Stunde. Bei der Ankunft im Valley of Fire treffen Sie Ihren lokalen Reiseleiter und erhalten eine Sicherheitseinweisung und Orientierung. Die Buggys sind speziell für das robuste Gelände in Nevada gebaut und mit Sicherheitsgurten und Überrollkäfigen ausgestattet. Einzelne Kinderwagen werden nicht angeboten; Wenn Sie einen eigenen Kinderwagen haben möchten, müssen Sie zwei Sitze kaufen. Legen Sie Ihren Helm und Ihre Schutzbrille auf und machen Sie sich auf den leuchtend roten Sand. Star Trek Fans können die Landschaft als Kulisse aus einigen frühen Star Trek Episoden erkennen. Bewundern Sie die jenseitigen Gesteinsformationen und Farben, die diese Gegend zu einem der besten Offroad-Gebiete in den Vereinigten Staaten gemacht haben. Halten Sie Ausschau nach heimischen Tierarten wie den beeindruckenden Dickhornschafen. Nach einer 3,5-stündigen Erkundung des Valley of Fire genießen Sie die Rückfahrt zu Ihrem Hotel in Las Vegas. Bitte beachten Sie: Der angezeigte Preis gilt pro Person, basierend auf sechs Passagieren. Es hat uns wahnsinnig viel Spass gemacht,das Valley ist traumhaft schön und die Tourbegleiter waren sehr freundlich!Wirklich zu empfehlen! If I could add a star or 3 I would!! What an amazing trip. Firstly, I have to apologise to the service provider...I decided tonight it is a good time to say thanks to all the Viator service providers who made our trips so much fun. I am nearly 2 years late....but I have to mention that visiting Las Vegas was not my idea of how I want to spend a family vacation....shows and 'the strip'....but I will never think of Las Vegas as those things again. We met the most amazing people on this 'driving buggies in the desert', a hike, kayaking ... we were picked up at our hotel...not knowing what to expect, being in the middle of so much neon signs as we have not seen in our lives!... so we got all the safety gear, were briefed and off we went...the two of us and our 6 children...we were 4 people to a buggy and each got a chance to drive. We stopped at points to change drivers and had so much fun climbing boulders, checking out rock paintings, just being in this amazing space with clear, clear blue sky. One of my favourite pictures of our children on a big boulder, each doing his/her own thing, with the bluest of skies behind them! I must say the only negative part of this trip was that it had to actually end! ....but ...the trip did not end there - we had a wonderful lunch of sandwiches with everything you would like on a sandwich at a little diner along the way back! ...maybe 'just another day' for these guys, but to us it was a family bonding experience which we all enjoyed and will remember forever - thanks you guys! It was awesome. If you like nature, fun and a 'new landscape, do this trip, there is nothing hard or even remotely dangerous about the trip - just a lot of fun and 'little moments' we thoroughly enjoyed it! and will definitely recommend i to anybody who wants to experience the real Las Vegas out there'! VERY bumpy, VERY disty but 100 worth it!! Amazing day out, would definitely recommend this tour. We went in November so the temperature was just right. We had two tour guides who were great. We even had a subway lunch thrown in too! This was without a doubt the best tour my son and I have ever taken. The guys and gals leading this trip were by far the best group ever to make sure you have a safe fun day but really made it a lot more than that. From Carmen to Robbins and Stephanie, They did a great job making sure we had the best day ever. My son enjoyed this day and has not finished talking about since. Carmen and Robbins really went out of their way to make sure we had the most fun possible. I highly recommend this trip. 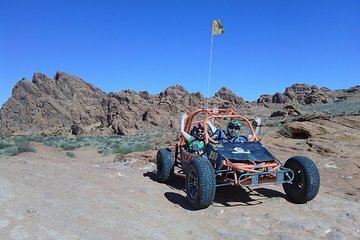 Didn't do the Valley of Fire as I booked the wrong tour but we were able to amend our trip to what we wanted and 2 hours of fun in the desert was an amazing day thank you all at Sunbuggy! Tive sorte de fazer esta excursão no vale do fogo, pois fui acompanhado pelo Fernando o guia e que fala Portugués e com o meu filho de 7 anos. Saimos pela manha, vieram nos buscar ao hotel as 07h00, fomos para o local da Sunbuggy onde os buggy são fabricados, dai partimos para o vale do fogo de pick up que fica a uns 80 km paramos para fazer uma pausa e tomar um café. Chegamos ao vale de fogo um sitio maravilhosos com cores vermelhas e dunas de areia vermelha ai fizemos um percurso fora de serie, dunas, caminhos com paisagens muito giras e tudo sem pressas paramos par visitar e beber pois o Fernando tinha bebidas frescas no seu buggy. De volta ofereceram-nos o almoço, tudo num ambiente porreiro. Obrigado Fernando pelo dia maravilhoso.